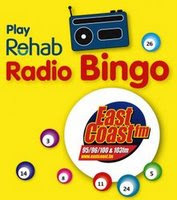 All vouchers are to be collected from the East Coast FM studio, Killarney Road, Bray between office hours Monday to Friday and redeemed from DID Electrical, Southern Cross Retail Park, Bray. All with thanks to DID Electrical, Southern Cross Retail Park, Bray! Paul Byrne still remains out with a Knee injury. Eddie Gormley does welcome back from suspension the experienced trio of Dave Mulcahy, Stephen Brennan and Daire Doyle all of whom missed last weeks game with Derry City. All this summer we have been giving away thousands of euro worth of prizes in the great DID Electrical Summer '09 Giveaway! The eight winners of the final draw will be announced by Declan Meehan on The Morning Show this Friday 4th September! !